Tin is in! Looking for some new elements for your home décor? Don’t discount tin. It works especially well in farmhouse décor, but you don’t have to have a farmhouse to use tin. 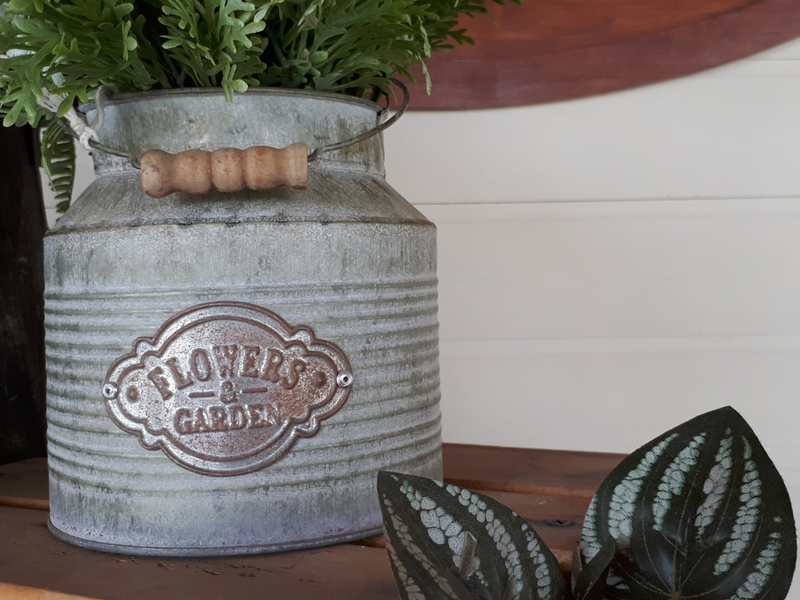 Check out the following ways to use tin home décor and see what appeals to you. You just might love all these tin home décor ideas! What is tin home décor? Tin is a term that describes anything from reclaimed corrugated or galvanized metal, to shiny new sheet metal. The ways to use tin in home decor applications are pretty endless. Brand new tin is fun to use, as you can allow it to naturally age over time and change appearance. You can also use aged, reclaimed metal with no need to clean it up or make it look shiny. Aged tin has its own charm! 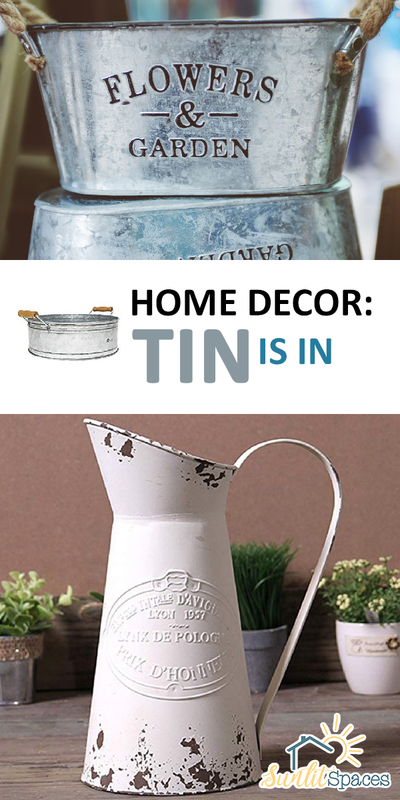 New or aged, tin home décor will really update your home! One way to use tin home décor is on a ceiling. 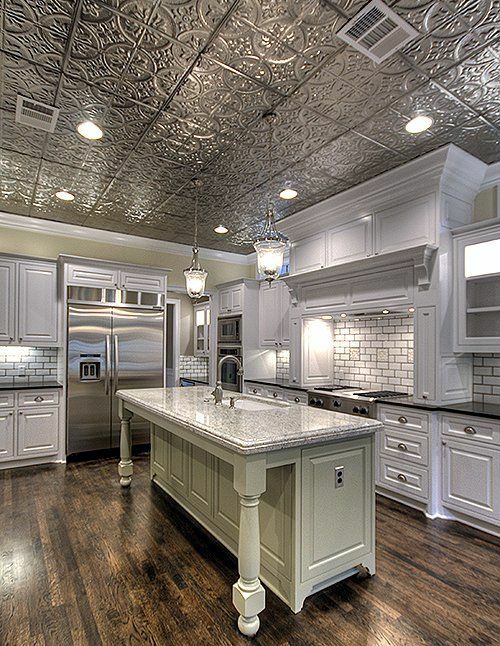 I love how tin is used to accent the recessed ceiling in this elegant kitchen. Notice that the tin does not detract from the rest of the kitchen, but actually adds interest and even more elegance to the overall look. Gorgeous! Just for kicks, here’s an example of tin home décor that covers an entire farmhouse kitchen ceiling. In a small kitchen with limited outdoor light, the tin reflects light and helps the space feel bigger. Tin also makes appealing wall décor. 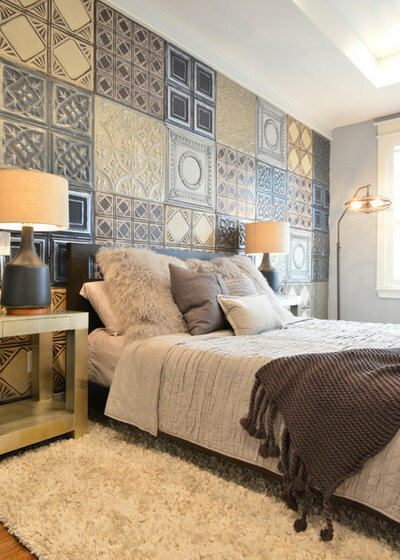 Tin panels are interspersed on the accent wall of this eclectic master bedroom in Houston. 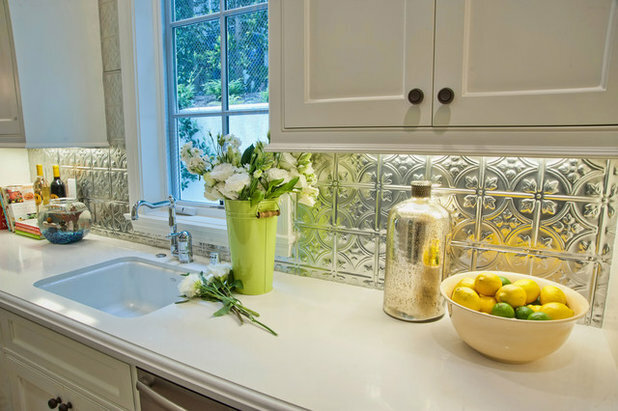 Need a backsplash that perfectly accents a white or neutral kitchen? Try tin! Once again, I really love how it reflects light and makes spaces feel bigger. 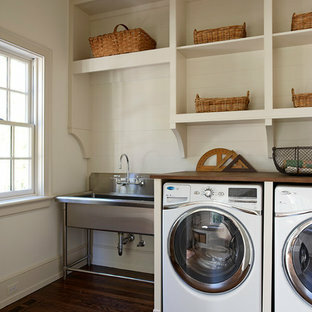 A tin tub makes a rustic sink in a laundry room. 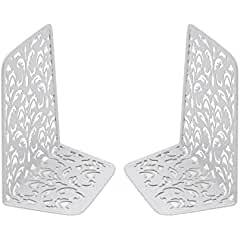 The large size allows you to hand wash a lot of delicate items at one time. 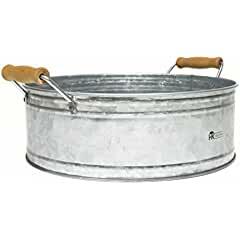 I’d also use it for a small pet’s bath time.Tin home décor can be used for almost anything! 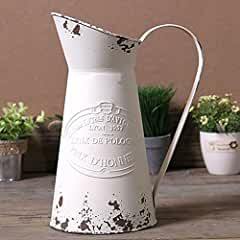 For an assortment of small tin home décor items, check out what you can find at Amazon!